Windows 7 has already proved to be a drastic improvement over its predecessor. For those of you who have been staying up with the latest Windows 7 news, you may have heard mention of the ‘GodMode’ feature. So what exactly is God Mode? And how can you enable Windows 7 God Mode? 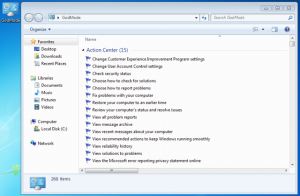 God Mode compiles just about every aspect of Windows 7 customization into a single place. Navigate to your desktop (Right-click the Start menu and select Show the Desktop). Right-click on your desktop, scroll down to “New”, and select “Folder” from the context menu. When the new folder appears on your desktop (with the text “New Folder” highlighted), paste the characters that you copied in step 1 (Either pressing CTRL+V or right-clicking the higlighted text and selecting Paste). That’s all there is to it. Once you press enter, the name of the folder will change to GodMode, and you will know that it worked correctly. Now, just double-click to open your new God Mode folder and see all of the settings at your fingertips.